Oahu has 227 miles of shoreline so you know there are a wide variety of water sports activities. But this volcanic island, which is part of what's called the Pacific Ring of Fire, has so much more that you are sure to enjoy your stay! While visiting Oahu, don't forget to keep an eye out for the rainbows that make this island famous. Due to frequent warm rainfalls on various parts of the island, it is a common occurrence to spot one over the mountains and valleys. Air-conditioned and licensed round-trip transportation from near your Oahu cruise pier! English speaking, local and trained Oahu shore excursion guides! Driving orientation of Honolulu City! Driving orientation of the Punchbowl Cemetery! Visit to Pearl Harbor Visitors Center! Shuttle ride to Arizona Memorial (see notes)! Escape the cruise ship shore excursion crowds and enjoy unique sights of Oahu and surrounding area! 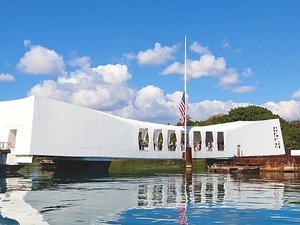 See the highlights of Honolulu and visit Pearl Harbor, home to the Arizona Memorial. Exclusive boat trip with a maximum of just 20 guests! Approximately 20 minutes inside a custom-made, metal shark cage allowing you to see sharks up close! See shark guaranteed or full refund! Mask and snorkel included during experience! What if you could see a shark up close in it's natural setting and replace fear with respect? Now you can! This Oahu excursion will let you get up close with sharks while in the safety of a metal cage.